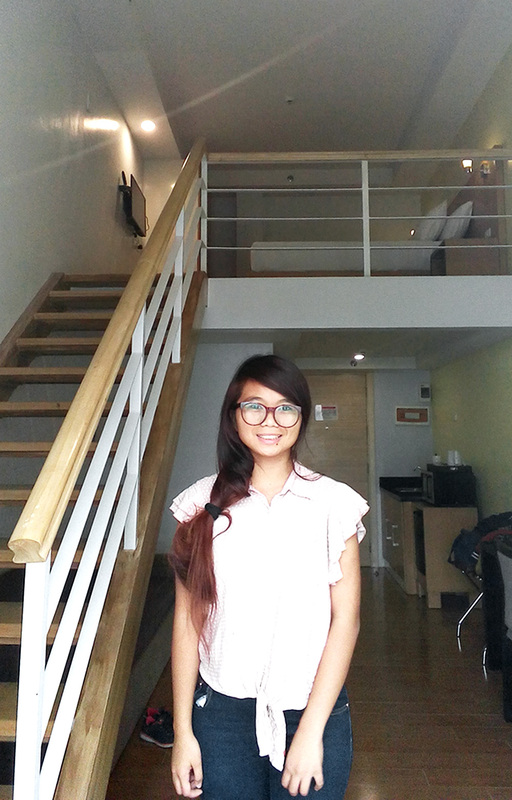 When I was in Manila 2 weeks ago, AurumOne Makati became my home for the first 2 nights. After arriving at Ninoy Aquino International airport, I went straight to find a Grab booth and booked a ride to the hotel. Luckily, Grab offers a PhP 100 discount for TBEX delegates. After 15 minutes, I had arrived outside the entrance of AuromOne Makati. As I walked up to reception, it only took a few seconds to realize the interior was even much nicer than the exterior. 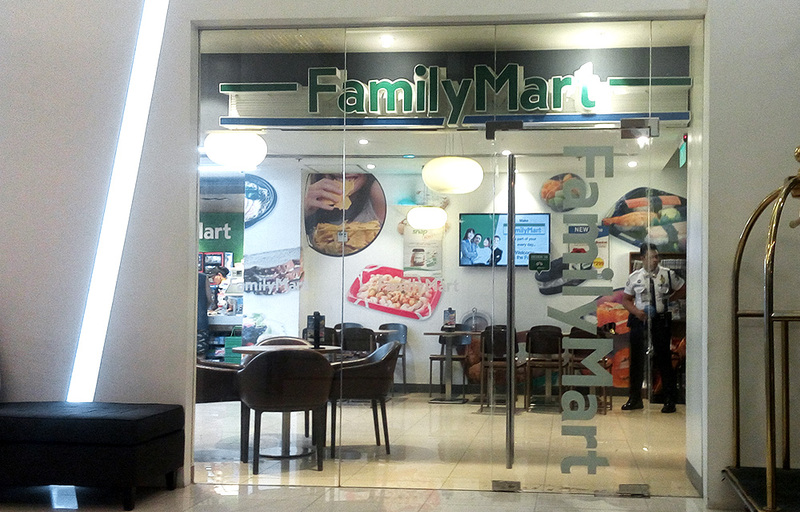 On the first floor of the hotel lies the hotel reception and Family Mart, a convenience store where you can grab some snacks, drinks, and more. Checking-in, I presented my confirmation letter and my ID, and I was greeted by a man in his late-30's in uniform. After check-in, the man offered to take my luggage up and gladly showed me where my room is. He then gave me his business card and little did I know that the man is the Operations Supervisor of the hotel, Mr. Al. I always love the moment I swipe my keycard into a new hotel room. It always comes with a combination of excitement and suspense, and AurumOne Makati didn’t disappoint. The loft is hugely spacious and felt much more special than a standard hotel room. The loft suite is a 2 level room and instantly I felt relaxed. It felt like I was within the comforts of my own home. Honestly, one thing that really freaks me out is there's only one socket available in a hotel room; but this room didn't dash my hopes and one of the best thing is you can find sockets almost anywhere which I really do love. It had its own kitchenette with microwave, mini-fridge, and coffee/tea maker. It is complete with dining utensils too. The room has 2 cabled flatscreen TVs (one for each levels), a desk with lamp, a round coffee table with chairs, and a sofa which is really comfy. 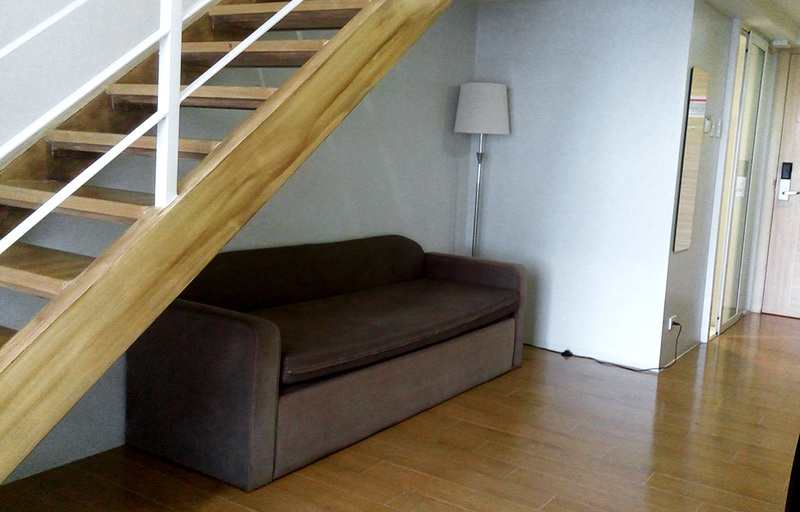 Upstairs, the loft has a queen-sized bed, 2 bed side tables, built-in cabinets, and an in-room safe. Inside the built-in cabinet, is an in-room safe, white fluffy white robes and all added to the hotel experience. I let my friend have the bed all by herself because I prefer to sleep downstairs. Yep, I used the couch as my bed for the whole duration of my stay because it was really comfy. 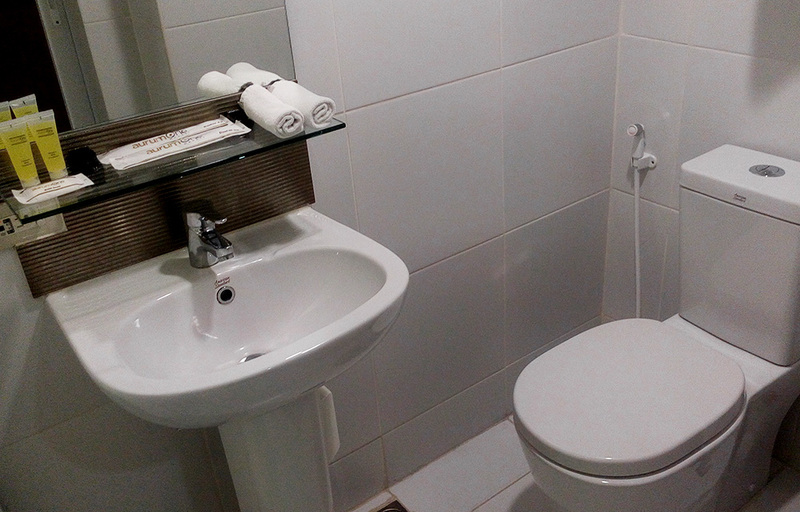 The all-white bathroom was readily stocked with 2 bottled shampoos, 2 dental kits, 2 soaps, shaving kit, towels... meaning short-breakers can leave all the heavy toiletries behind such as shampoo and conditioner – hooray! My favorite part of our room is its large bay window, draped with a full length sheer curtain and box pleated curtains which gives the whole room a tailored look. 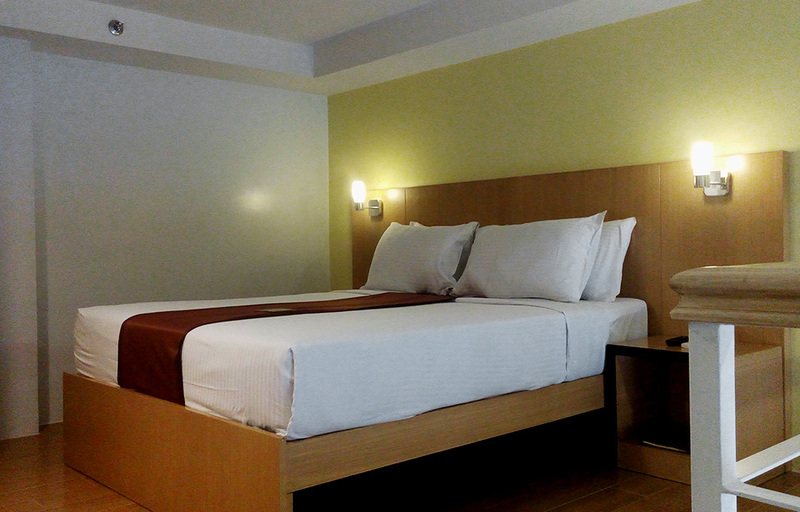 Price: Deluxe Rooms start at around $33. You may check the latest price in: Booking.com | Agoda | Hotels.com | Expedia | Travelbook.ph or read reviews on TripAdvisor. For inquiries and other information, you may visit their official website. For other luxury hotel reviews, click here. TIP: A laundry shop is just next door along the side street (del Pilar) in case you don't want to pay hotel laundry prices. No stay at AurumOne Makati is complete without a breakfast at The Nook, so each morning of our stay this was our morning dose of energy before heading out to Philippine International Convention Center. 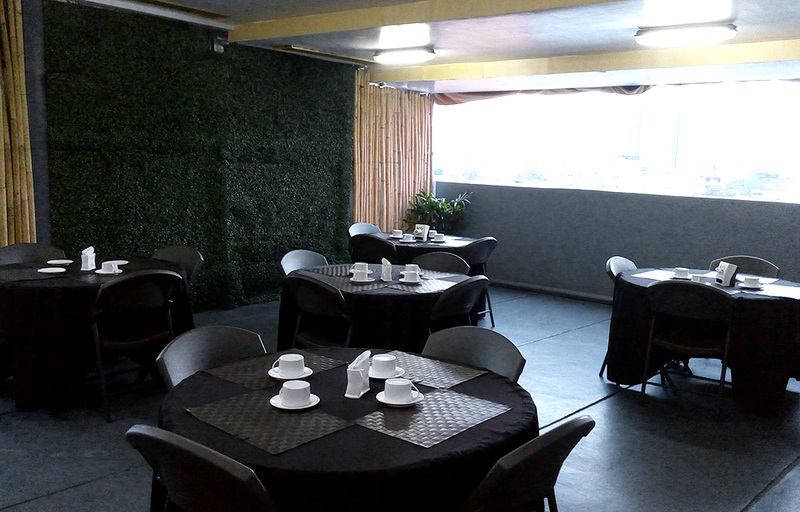 The Nook is located at the uppermost part of the building and the scene is perfect for a morning coffee. Breakfast at The Nook is available every 6:00 AM to 10:00 AM. 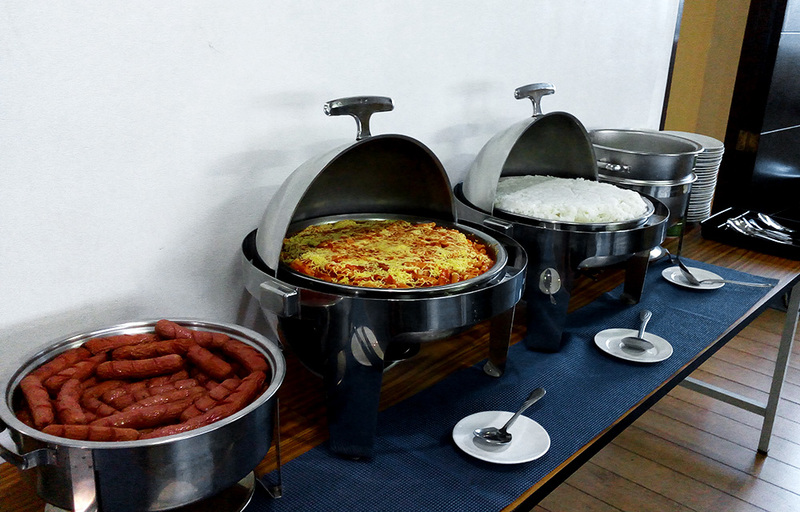 The Nook offers breakfast buffet of rice, hot dogs, lasagna, toasts, bacon, fresh fruits, and there's a lot to choose from, but I had more craving for a hot soup and enjoyed a classic breakfast. After spending 2 nights at Makati, it didn’t take long to realize how amazingly well located AurumOne is. It is located at 1682 Evangelista cor Hen. Del Pilar Street, Bangkal, Makati City. The hotel sits strategically within the boundaries of Makati, Parañaque and Pasay City which allows easy access to these key cities. 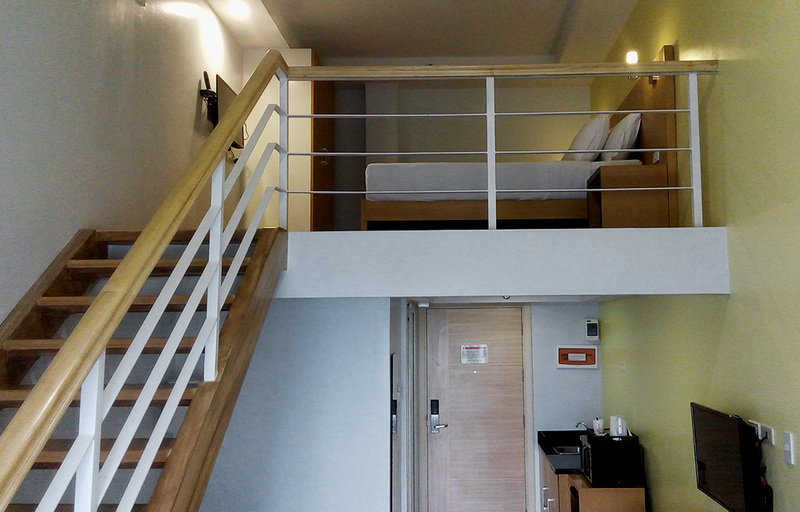 The hotel is proximately near the International and Domestic Airports, Makati Central Business District, PICC, CCP, Ayala Museum and Fort Bonifacio, Taguig. Hungry? Well, there are a lot of eatery, convenience stores, pharmacies, banks, and bakeries around the area. Plus, if you're craving for some McDo french fries, Mang Inasal's chicken, you are in for a treat because everything you need is just a walking distance. For a versatile location in Manila, I can’t possibly imagine a better hotel to stay at than AurumOne. My stay at AurumOne Makati was an absolute delight from start to finish. I enjoyed the breakfasts each morning, minimalistic surroundings and fantastic service. Along with some very thoughtful extras, all these things made my whole Manila trip very memorable. 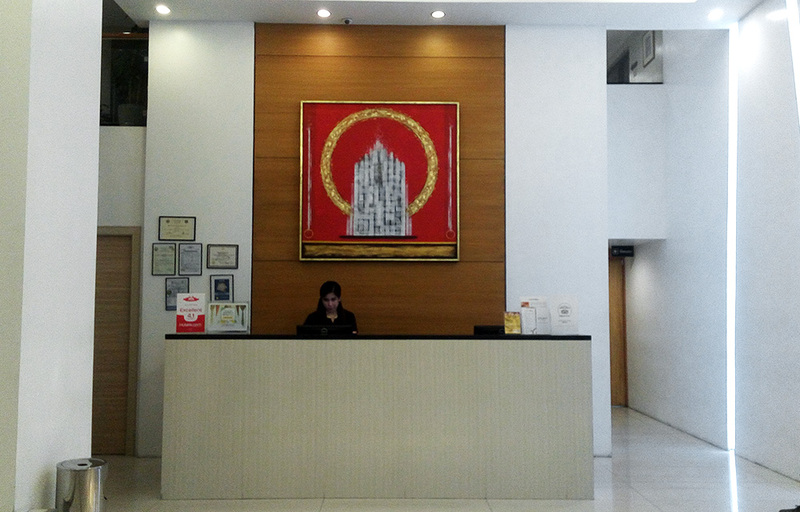 The friendly staff cannot do more to make you feel welcome. 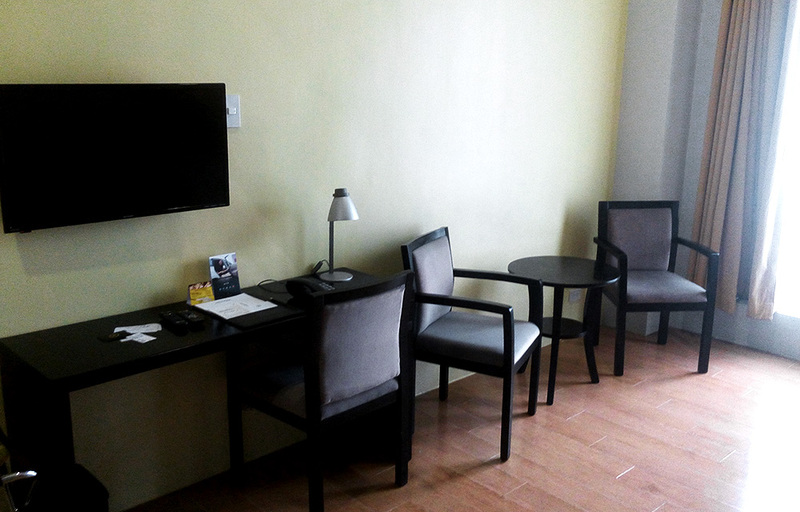 If you are thinking of booking a luxurious short break in Manila, I would recommend AurumOne Makati in a heartbeat. 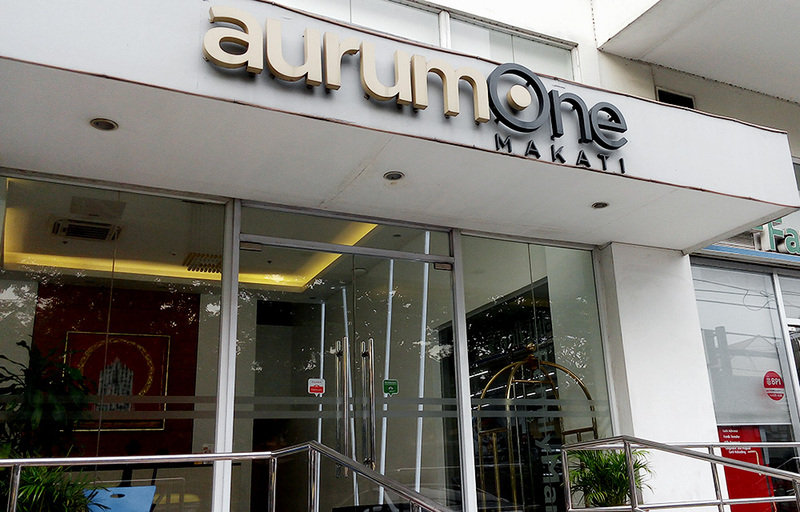 The use of this 360° virtual tour of Aurum One Makati is authorized by Traveloka. 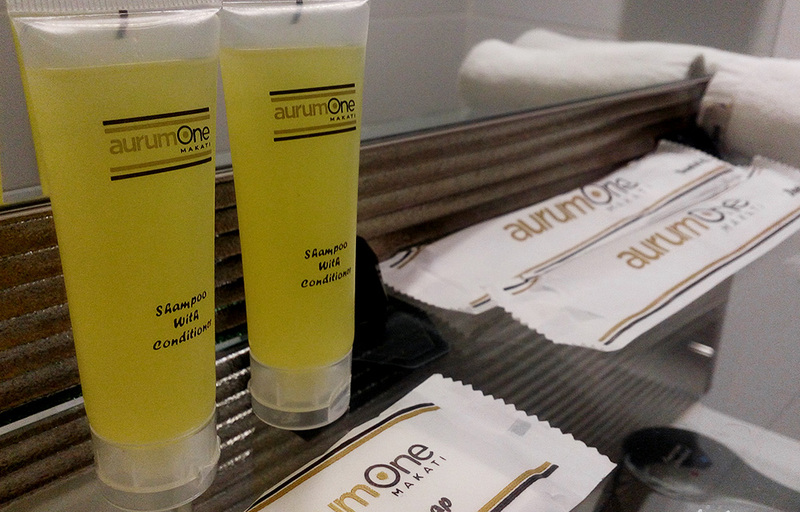 What did you think of my experience at AurumOne Makati hotel? Are you thinking of staying at AurumOne or have you recently enjoyed a stay here yourself? If you want to know anything else about the hotel or if you enjoyed this post, please drop a comment in the box below and let me know! Looks like a simple set up but well packed. It should be comfortable stay here. Thank you for sharing about your stay at the AurumOne Makati. I've never heard about it and it's just a few blocks away from where I currently live. I'll probably try to stay there one day with my family just for a quick getaway. I love that the bed was on the loft. You mentioning about the fantastic service sealed the deal for me. Wow, that loft looked stunningly expensive :)) I can imagine the comfort staying at that place is just so damn high haha. And the breakfasts at the Nook, what a chill life. But I see they don't have a pool, yes? I love loft suites. It is far my conventional home. 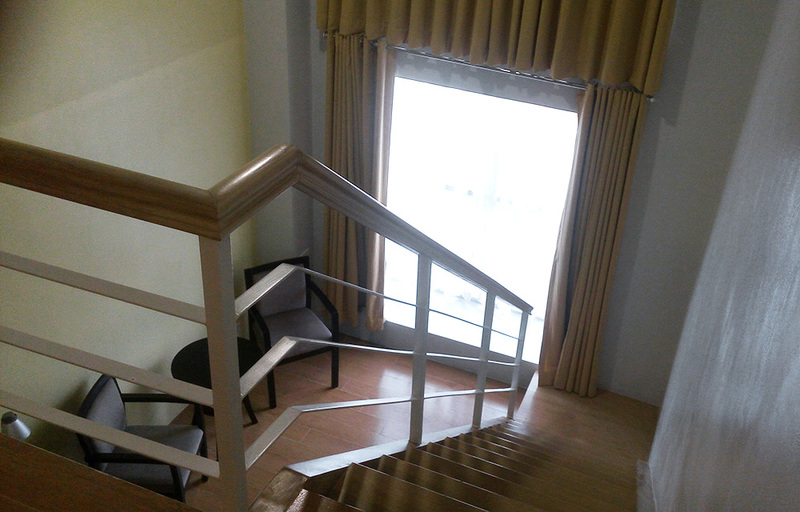 Whenever I go to NCR, the hotel that I always stayed at has a loft suite. It is somewhere in Paranaque. This however, looks more cozy. if only I knew about this before I came here in manila, I should have booked this one. This is the kind of place I'd love to be myself too. I wonder if their internet connetion is fast, like I can upload and download apps. hehehe. My work needs serious internet connection, sometimes, i find it hard to look some in the hotels here. I recently experienced a boutique stay too. And just like you,stayed in a loft! Thoda sounds like a wonderful experience! Will visit some time for sure! I love the hotel room! I've never had a 2 level room. It looks awesome. 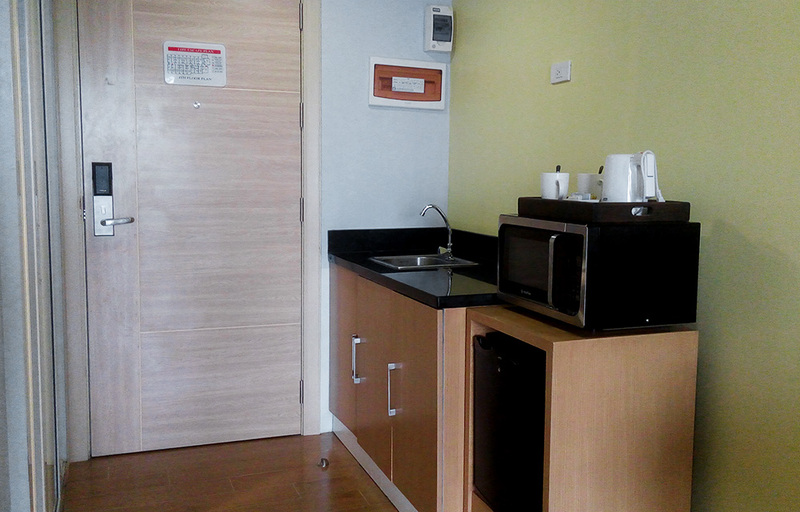 2 Tv's, a kitchenette, coffe/tea maker etc.. Very nice! The breakfast looks very nice as well. Great start of the day. Good to know you had a great stay there! If I would go on holiday I'd definitely want to try out this hotel! Excellent timing. I'm looking for hotel to stay at in the city. This seem comfy, clean and affordable. I love the idea of a loft! I didn't know there was a hotel in the Bangkal area! Good to know. I know the area can be a bit clogged with traffic on most days, so I may consider this hotel if I happen to get caught in the area on busy work days and need a place to crash. The deluxe room is already affordable eh. I would love to experience some rest after giving birth and after all the pregnancy hulabaloos I've experienced. Seeing your photos makes me want to book a hotel now.